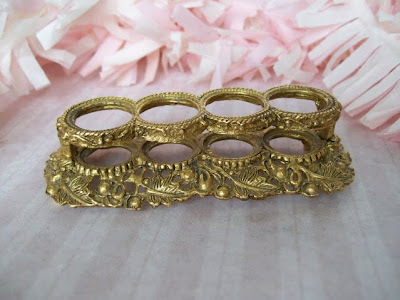 In our travels, looking for great vintage pieces, we come across old vanity items. 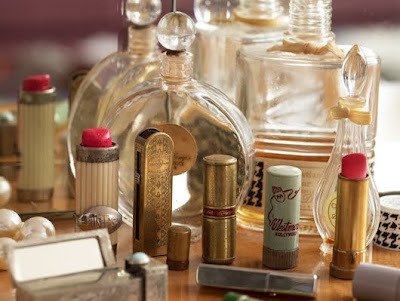 Mirrored trays, compacts, perfume bottles, rouge and more. I found a great article on a new magazine called Home & Antiques. They had a few pictures I really liked. This is one of them. I also borrowed the next two to show you some of the neat things you can find when hunting through old things. I love the old graphics on these containers. 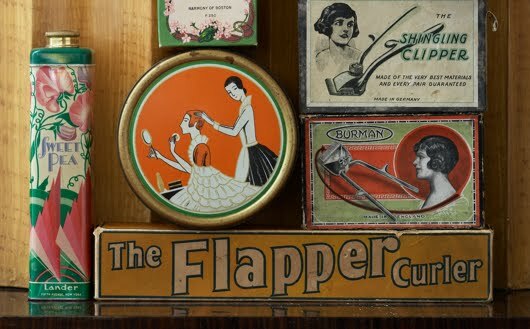 How I'd like to try the "Flapper Curler!" I would of course, need to cut my hair short. This image conjures up thoughts of the 1940's and the USO. World Wars are not glamorous. "...wearing make-up wasn’t just a pleasure, it was part of a woman’s patriotic duty." 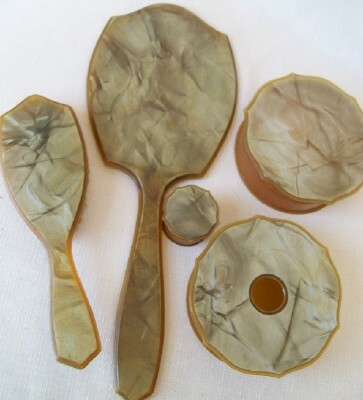 This vintage celluloid vanity set is from the same era if not a little earlier. 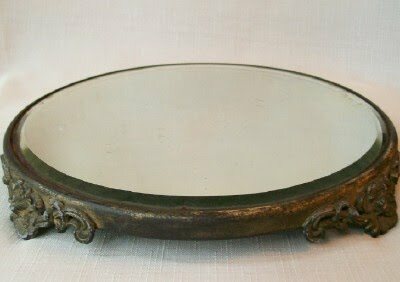 I love the vintage style of this mirrored plateau. 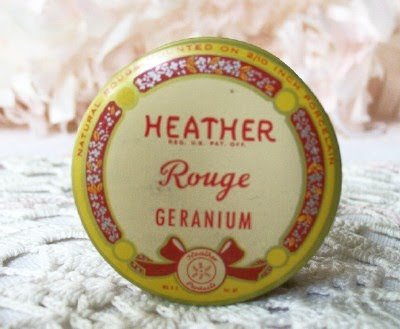 You won't find one of these Heather Rouge tins in today's drugstore. There is still makeup inside! A lovely shade of red called "Geranium." For the organized gal. 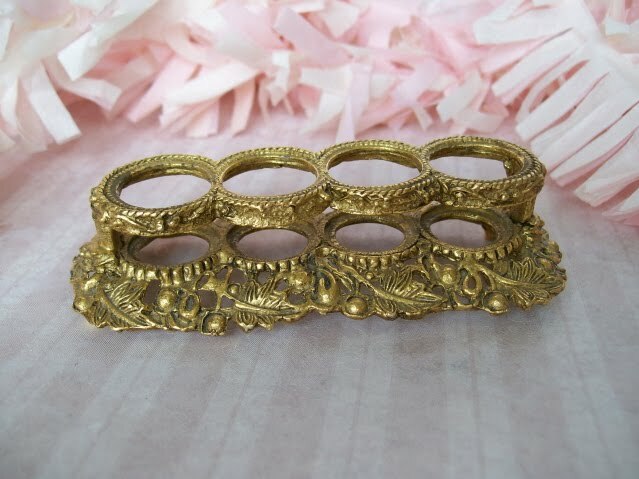 A lipstick holder. 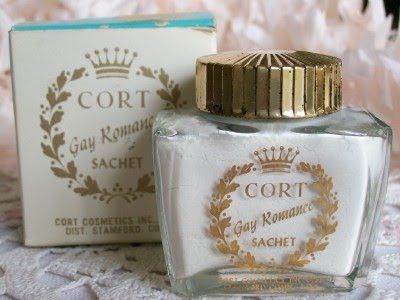 Sweet little bottle with a pretty scent. A little bit of gay romance! Isn't it funny how our language has changed? Another lipstick holder... with a bit of aurora borealis bling! dealing with in life? Were they single gals, housewives, or career girls? Pieces of the past which connect us to a vintage world of beauty and glamour. While the look has changed our desire to sparkle and shine remains the same. I hope you enjoyed today's journey back in time! 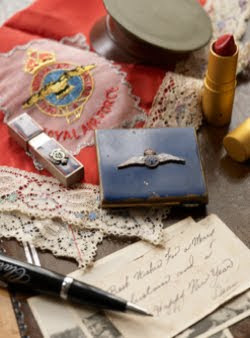 Love all your romantic finds from the WWII era. Those were tough ladies who held down the fort while their men were away fighting, but they never lost their femininity! 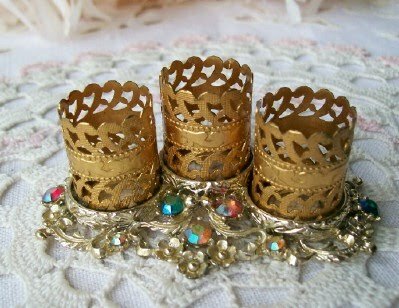 I really love the lipstick holder with the jewels. I know what you mean...I always wonder who owned these things and what was their life was like back then. The lipstick looks much bolder, and the women seemed so elegant. I really enjoyed your post today. I love this post, ... so romantic.I wish sometimes for that style and elegance that women of that era possessed. Thanks so much for sharing such treasures. Lovely glamour bits! I have a few special items that were my mom's back in the day - she kept them all these years. Also, some pieces from my grandmother's collections. 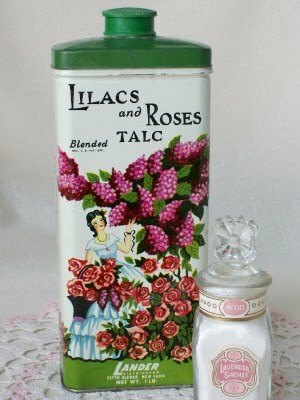 My other grandmother seemingly NEVER cleared out her cabinet and there were ancient products there. But, my aunties got to it before I did and in the dumpster - kerplunk!